Did You Break your Nose? Our noses are one of the most prominent aspects of our faces, and for some of us one of the most protuberant. As such, when our faces hit other things around us, the nose frequently gets the brunt of the assault and does what it is designed to do, which is to break as it absorbs the shock aimed at our face. Should A Doctor Be Seen For A Broken Nose? Can I Still Wear Glasses? The nose on the outside can be generally divided into three parts. The upper third consists of a set of nasal bones. The remaining lower two thirds are each made up of a paired set of cartilages. The bridge or dorsum of the nose is made up of the nasal bones and middle cartilages. The lower third consists of a pair of cartilages that span from the side of the nostrils into the middle. These form what is called the nasal tip, or the most prominent point of the nose. The nose serves several important functions. It is the area of highest airway resistance from the mouth all the way to the lungs when breathing, so any narrowing may cause a great deal of discomfort. This may be especially noticeable in times of increased oxygen demand, such as exercising. The nose warms and moistens the air we breathe, again to make it more comfortable to breathe. The internal nose has several major components – the nasal septum, the turbinates, and the paranasal sinuses. The nasal septum is the dividing partition between the left and right sides of the nose. It consists of cartilage in the front and bone further back. Lining both sides of the cartilage or bone is mucosa (the pink internal lining of the entire nose and sinuses). A deviated nasal septum simply refers to a septum that is not completely straight. Each side of the nose has three swellings of tissue called the turbinates (see picture). They extend from the front of the nose to the back of the nose and function to warm and moisten the air when we breathe in through the nose. The inferior turbinate is the largest, and if enlarged, may cause difficulty breathing through the nose. Many factors may cause swelling such as allergies. Most of the sinuses drain into the nose under the middle turbinate, so this is a very important area in regards to proper sinus function. The sinuses are simply air filled chambers that surround and empty into the nose. There is a tremendous variability to everyone’s sinuses as they develop from infancy to teenage years. Interestingly, no one really knows why the sinuses exist. Different theories include lightening the weight of the head, acting as a cushion if there is any facial trauma, and allowing the voice to resonate. If you have suffered an injury to your nose and it is bruised or even broken, there are some treatments available to help alleviate some of the pain. It is important to be able to tell if your nose has been broken or if it is just swollen immediately after your injury. The following symptoms could show signs of a broken nose: a crooked or bent looking nose, swelling and/or pain around the nose, blocked breathing from one or both nostrils, bleeding from your nose, or if you can hear a sound when you move your nose around. Please keep in mind that swelling can cause the nose to look crooked or bent. Those are some symptoms that can help you determine whether or not you have a broken nose. It is important to see a doctor as soon as possible after the injury occurs. A septal hematoma is a medical emergency where a collection of blood applies pressure to the nasal septum. This can cause an infection that can erode the cartilage and collapse the nose. It is best to see an Otolaryngologist as they can diagnose and treat the condition at the same time. Diagnosis is usually made by physical examination and an X-ray is rarely necessary. Emergency room physicians may tell you to wait more than 2 weeks to get a specialist opinion. Waiting with an actual nasal fracture may not be in your best interest. The best time to evaluate a broken nose is in the first 24 hours or after the swelling goes down at day 3 or 4. Insurance almost always cover the cost of broken nose, sinus surgery and deviated septum repair. These are considered functional issues and improving nasal function is currently treated as medically necessary. Insurance will never cover a purely cosmetic surgery, although the appearance of your nose may be improved after functional surgery. Your for-profit insurance carrier does not make money by paying claims. We will check your benefits for you and let you know what they are. By about three to four weeks after the injury, the nasal bones will have started to set and are pretty solid. Until then, you can't wear your glasses on your nose, as to not cause any shifting of the nasal bones and cartilage, causing more problems. You have a couple of options to help with this issue, you can either tape your glasses to your forehead or you can buy an eyeglass support. Our product NoseComfort Eyeglass Support is designed to replace the tape entirely so there is no issue with replacing the tape constantly and possibly causing skin irritation. NoseComfort is 100% Hypoallergenic for a safe and comfortable fit and function, and supports your eyewear (reading glasses, sunglasses, ect.) off your nose by a few millimeters to keep your glasses in the proper position allowing you to go about your daily business. Complications of a nasal fracture are mainly permanent nasal obstruction and cosmetic deformity of the nose. Fracture of the bones or bending of the septal cartilage can twist tip or make the nose look like its off to the side of the face. A septal fracture can cause a hole in the septum (septal perforation) and subsequent nasal collapse (saddle nose deformity). The fluid that surrounds the brain, cerebrospinal fluid or CSF, can leak if the lining above the sinuses is cut. You can have loss or decrease in your sense of smell. Infections of the nose or sinuses may occur or become permanent. Other facial bones may be fractured and your doctor should check carefully for any addition head or neck injuries. Obtain emergency medical attention if you suspect you may have a CSF leak, septal hematoma, or a severe nosebleed (epistaxis). The First Few Minutes - Within minutes of a broken nose, the nose will swell up, you may also have bleeding and migraines as well, and it is very difficult to tell what the bone structure looks like underneath. The best time to fix a broken nose is after the swelling has gone down - usually after 3 days from the injury. After 3 Days - After a few days, the soft tissue swelling inside the nose will have gone down and the dried blood will have cleared away. You should now be able to breath through the nose at this time. If your nose still feels blocked, you may have suffered a deviated septum when you broke your nose. You may need to undergo a "Septoplasty" procedure. Have a good look at yourself in the mirror and ask family / close friends to look at your nose. If your nose looks different and you want it fixed, you need to undergo a surgical procedure within 2 weeks from the time of injury. 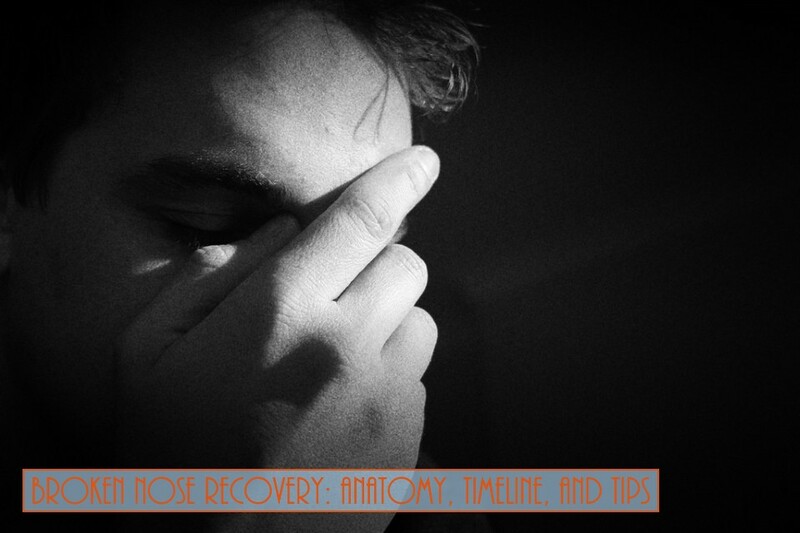 You need to be seen and the procedure needs to be booked and performed within 2 weeks from the time of injury. After 2 weeks, a simple corrective procedure cannot be performed and you will need to undergo a bigger operation. Under 2 Weeks - Under 2 weeks from the time of injury, with minor injuries, it is often possible to perform a simple corrective procedure. In this procedure, Dr Singh pushes on the nose and the nose re-breaks along the existing fracture lines. Dr Singh then re-sets the bones of the nose into the correct position. The procedure is relatively quick, performed while you are asleep (general anaesthetic) and no cuts are made. After 2 Weeks - After 2 weeks from the time of injury, a simple corrective procedure cannot be performed. This is because the fracture lines have already begun healing. Pushing on the nose after 2 weeks will not result in a break along the existing fracture lines - instead the nose may break in the wrong position, causing more deformity. At this time, to correct the shape of the nose requires a bigger Rhinoplasty operation. This can take several hours. Cuts are made and chisels used to re-shape the nose. With a Rhinoplasty operation, the nose can be re-shaped much more. A Rhinoplasty operation can be performed at any time after your injury. After 3 - 5 Weeks - After 3 - 5 weeks have passed, you should be in the clear. Around this time your nose should be back to it's proper form and function, all of the swelling and bruising will have subsided and your nose will be back to normal, like nothing ever happened. There are a few home treatments that you can do to help your symptoms. Applying an ice pack is the most common and effective way to help reduce swelling and stop bleeding. If you do not have an ice pack, a bag of frozen peas or other frozen vegetables can be an alternative. You should apply the ice pack with a washcloth wrapped around it. Place on your nose for about ten to fifteen minutes and repeat up to four times a day. You should do this for the first couple of days after your injury to reduce swelling. Taking nasal decongestants can help you breathe better. You can take an over-the-counter acetaminophen such as Tylenol for any head pain you may be suffering from. Keeping your head elevated can also help reduce the head pain. Keep your head elevated at all times, even when sleeping. If any bleeding occurs it is important to have your head up because you do not want the blood to drain through your throat. Try these home treatments to help reduce the swelling and pain from your nose.